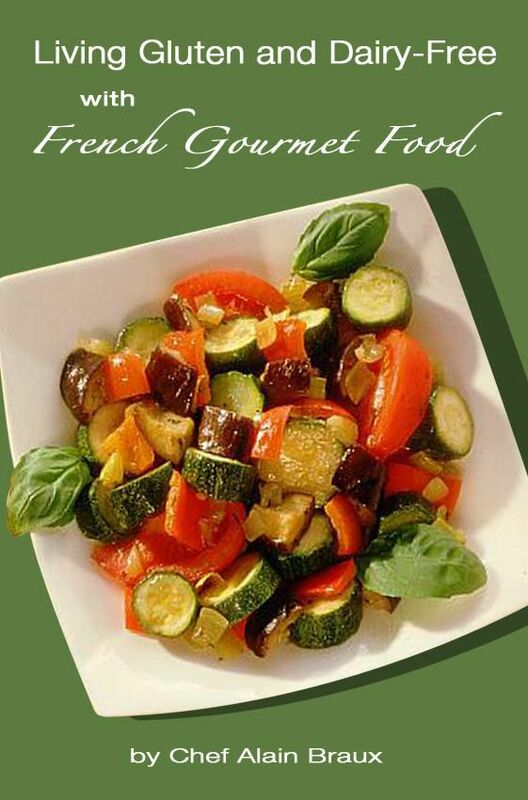 Gluten and Dairy-Free French Gourmet Food! 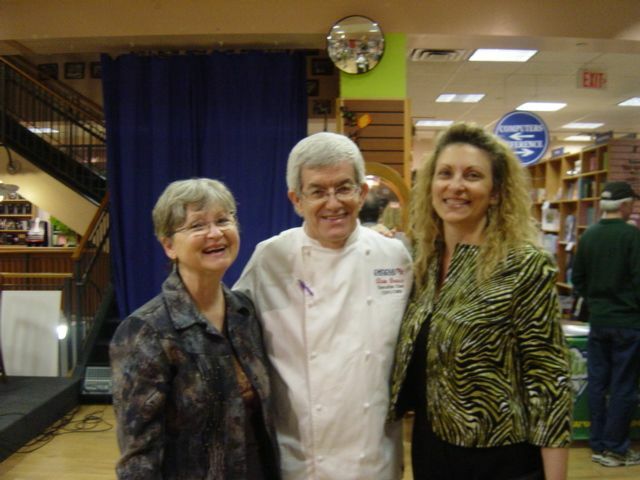 “Living Gluten and Dairy-Free with French Gourmet Food” is the second cookbook by Austin Chef Alain Braux. Alain has impressive credentials as a traditionally trained French chef but, even more interesting, is a nutritherapist – a term used in Europe for nutritionists who use only food as a healing medium, as opposed to conventional nutritionists, who usually work with supplements, homeopathy and herbal medicine. Since writing his first book, “How to Lower your Cholesterol with French Gourmet Food“, Alain recently discovered that he was gluten intolerant and has gone on to compile his knowledge into a new book for those of us who love good food, more especially traditional French food. Alain’s comment `gluten-free junk food is still junk food’ is such an astute observation and one that resonates deeply with Rita and me. He believes we should eat thoughtfully, be aware, and indulge carefully on special occasions. Now about those recipes: this book contains a carefully chosen distillation of Alain’s gluten-free baking repertoire that focus on breads, breakfast, tea time treats, and cookies. 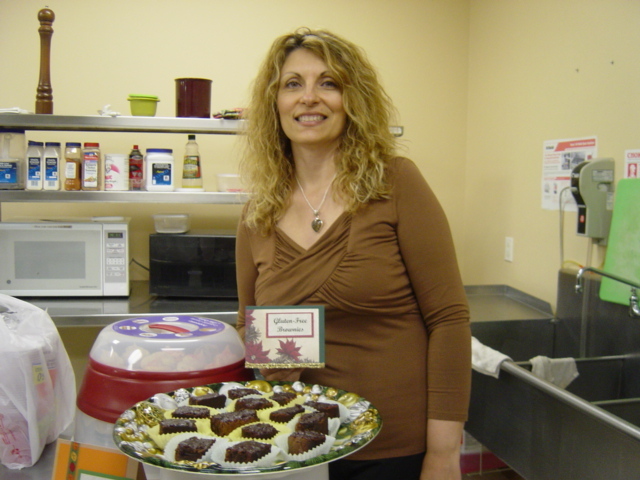 The dairy-free options are carefully noted as not everyone with the gluten issues has problems with the dairy protein. The recipe that initially grabbed our attention was Brownies à la Farine de Coco or Coconut Flour Brownies (chocolate, go figure). We baked them for a benefit to raise money for a local Georgetown organization known as The Caring Place where I volunteer working in the food pantry. 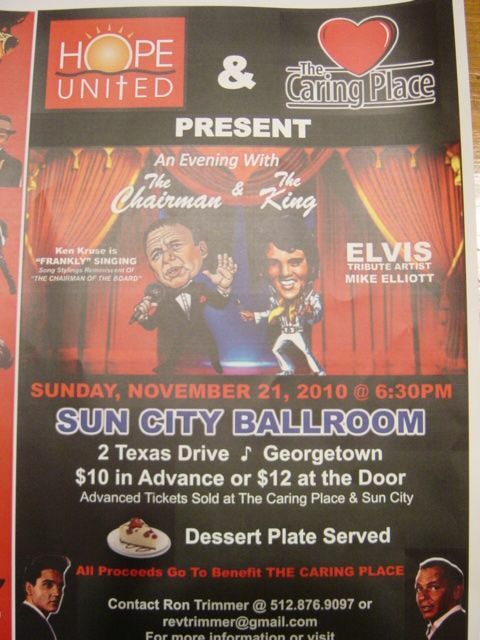 The benefit event was an evening of music with two tribute artists plus desserts contributed by a local bakery and homemade desserts created by The Caring Place volunteers. 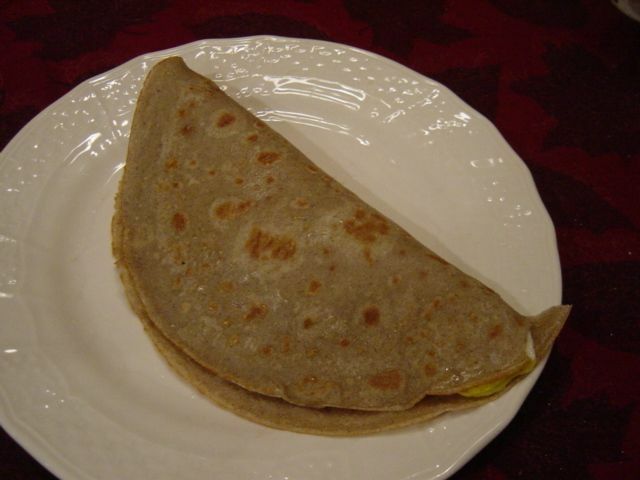 I make good tasting food but my presentation skills are not first rate – just never had that gene. Turning a basic pan of brownies into something that looked appealing next to professionally prepared items was worrisome. There were quite a few crumbs remaining in the baking pan (which were not wasted – Don had them as mix-ins for a scoop of ice cream). 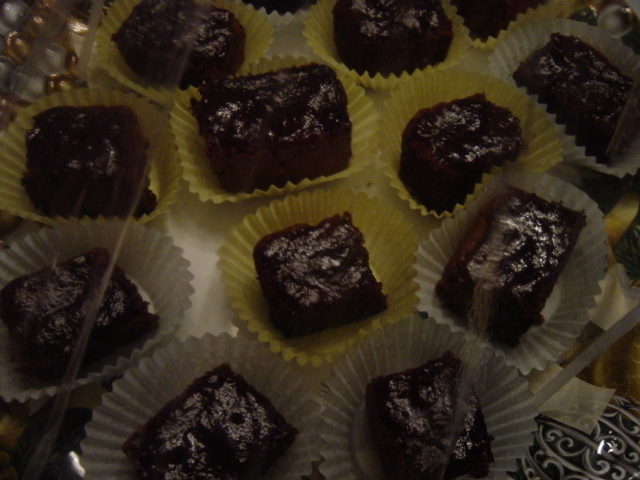 So each brownie was placed on a cupcake paper for background and I added about one-half teaspoon of melted raspberry jam as a glaze to anchor any more stray crumbs. The chocolate-raspberry fragrance was nearly intoxicating as Rita and I drove them to the venue. Rita and I enjoyed listening to the two entertainers warming up and checking out the stage facilities while we helped with setting up the service tables. But we had been running all day so once it appeared that all was in order we headed back home to plot out our Thanksgiving meal. Our family Thanksgiving meal is on Friday this year due to travel considerations. It is working out so well that Friday may become our designated family gathering day. Rita and I are baking Alain’s Cookies au Chocolat et Pecans – Chocolate Chip and Pecan Cookies for one of our desserts at this meal. Have a wonderful weekend wherever you are with whatever and however you are celebrating! Playing with ingredients, dreaming up recipes, and trying to get that ‘just right’ texture is a fun kind of challenge for me and one that I greatly enjoy. But as Clara has reminded me on more than one occasion, some of you like to get in and out of the kitchen while still preparing good gluten-free food. The chemist-like experience of blending mixtures of flour does not thrill everyone. 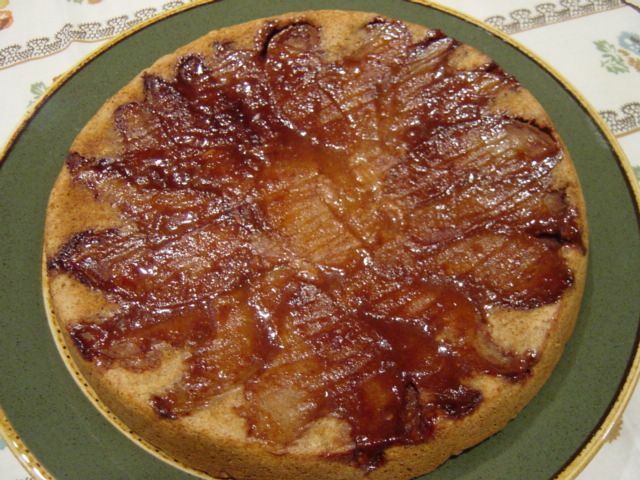 It does make sense to have a variety of gluten-free recipes to draw upon. and Rita completely agrees with this philosophy. Then Clara loaned me one of her favorite cookbooks, Rita brought over a bag of certified gluten-free oats, and a new round of recipe testing began. 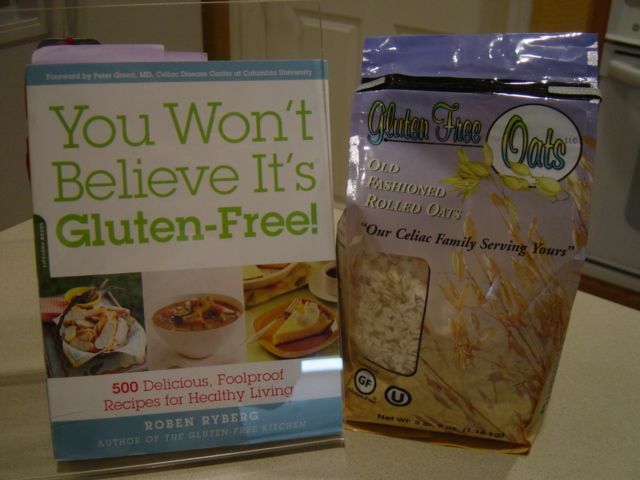 The book is You Won’t Believe It’s Gluten-Free by Roben Ryberg published in 2008. Her approach to simplification is single-grain recipes and she presents four basic ones to choose from; corn, potato, rice, and oats. We had the oatmeal so this past weekend we were off and running. We usually cut all of our test recipe ingredients in half because we just can’t eat all of our experiments. 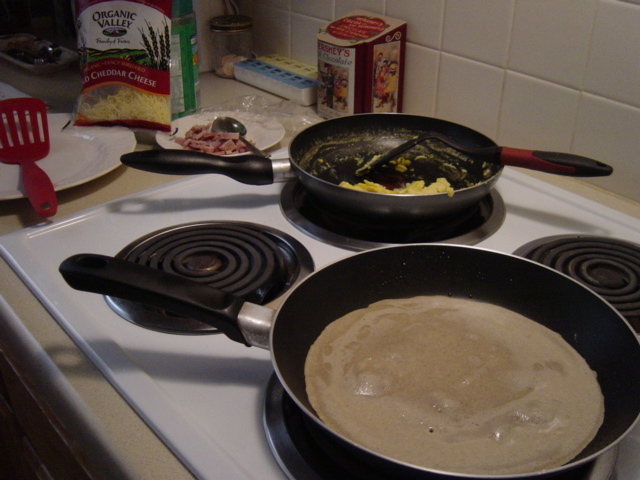 The first recipe we tried was for the oat-based pancakes. It was extremely helpful that Ms. Ryberg wrote the measurement for oat flour in cups and grams. Because of that we were able to weigh out the rolled oats and run them through the blender to make the correct amount of oat flour. 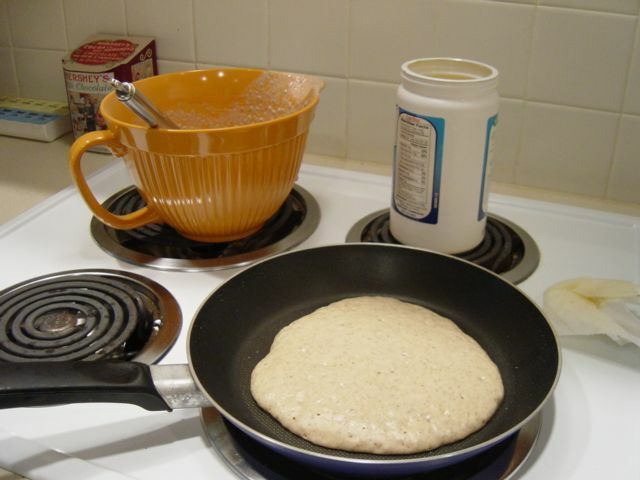 These pancakes were so close to our old family stand-by, Kiddies’ Favorite Pancakes, which I created for them when they were toddlers that it was amazing. The next recipe attempt was a little more ambitious – the oat-based Carrot Cake. I love a good carrot cake and the carrots and apple juice were already in the house, so no extra trip to the grocery store wasa needed. Since the recipe was for a single layer I made the whole recipe. Plus carrot cake begs for raisins and I added 1/4 cup of raisins. Usually I make cupcakes rather than a cake layer and attending to the cautionary note regarding ‘slightly crumbly ‘I added a little more xanthan as suggested. Rita nominated this cake to be our standard carrot cake recipe for the future! You Won’t Believe It’s Gluten-Free is a keeper and before I return this one to Clara (thank you so much for sharing) I will purchase one of my own.